On December 6, 22 years ago what most thought to be a regular day in school turned deadly. A 25 year old misogynist, Marc Lépine, marched in École Polytechnique classrooms and gunned down 14 students before taking his own life. All the victims were female. "I hate feminists," said the lone gunman. And just like that, the face of a once peaceful Montreal was mutilated forever. The security Montrealers took for granted was robbed in minutes. Mothers and fathers alike were horrified, devastated and scarred for their children. The innocent victims were attending the best engineering school in the city and had promising futures laid out before them. But on that faithful day their families would have to accept that their daughter's graduation, wedding and children would never come to be. It wasn't easy and it still isn't easy. 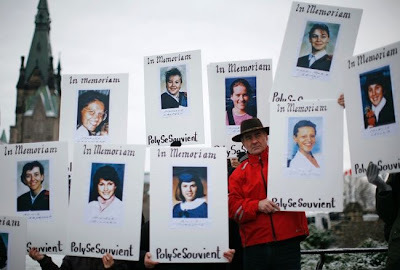 Demonstrators hold portraits of some of the victims of the Montreal Massacre during the National Day of Remembrance and Action on Violence Against Women rally on Parliament Hill in Ottawa Dec. 6, 2011. Memorials took place all across Canada on Tuesday. Thousands of people marched to denounce violence against women everywhere. In Ottawa, a rally on Parliament Hill was held for the 14 victims. Although the Conservative Party was not invited, Prime Minister Steven Harper released a statement marking December 6 as National Day of Remembrance. Why was the party in power not invited, you ask? Well, this anniversary brought the ongoing Bill C-19 debate to the forefront. This Bill's goal to abolish the Federal Gun Registry is an insult to the victims' families. The Federal Gun Registry was implemented in response to the Polytechnique massacre. It was meant to restraint firearms accessibility and by doing so keeping guns out of the wrong hands. "The progress that we keep making will be stalled, diminished or reversed," shooting survivor Heidi Rathjen told in a news conference in Quebec. In spite of all the controversy surrounding this day, the victims' families want us to remember their loved ones and join them by taking a stand against gender-based violence giving a voice to the women who are victimized daily by these cowardly crimes. Let's dedicate this day to loving all the women in our lives: our mothers, sisters, aunts, grandmothers, step-mothers, wives, mothers-in-law, girlfriends and be sties. PS: Stay tuned for the CBC chilling broadcast of 1989 later on today.